National Council for Civic Education and Development (NaCCED) has embarked on massive sensitization drive in the eastern district town of Kono last Friday. 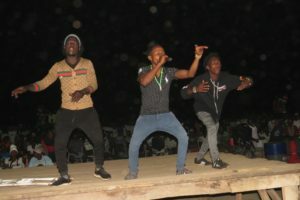 The show was organized at the Koidu Community Field where both local and national artists entertained guests as part of NaCCED’s strategy in disseminating relevant information from government and soliciting the views of the people. 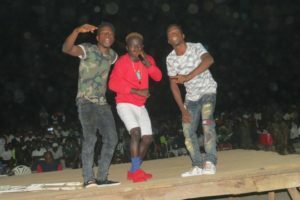 Freetown based artists including, Father A, Supa Sahr, Fatu Power Mix, Father Cross and Drizilik were among the many artists who entertained residents of Kono city and beyond. Chairman for NaCCED, Kalilu Totangi and his team were very vivid during the musical concert with youth who were glued to their respective seats as popular artists pumped in with their melodious songs that are currently hitting the airways. “We are here to engage our people on civics. It is timely that our youth are directly targeted on social, political, environment and other national concerns that bother on capacity building and national development programs. It is disheartening to note that the youth of today are bent on taking harmful drugs that will negatively impact on their health. The taking of tramadol without medical prescription and other harmful drugs have derailed the progress of young people. As a council that is responsible for civic education in the country, it is our responsibility to engage youth on some of these challenging issues. The rationale for this musical jamboree is to sensitize residents about the activities of the newly established council and how the youth can meaningfully contribute to the socio-economic development and democratization of the country,”said Kalilu Totangi. He added that civic education empowers people not only to know their rights but also their responsibilities to the state and governance processes.
. According to Patricia, the concept aims at teaching people about their rights and responsibilities, as part of a democratic society and for them to have a more accountable government. She said public education is an essential tool for citizens’ empowerment and it is clearly fundamental for a stronger democracy. “Civic education is concerned with three different elements: civic knowledge, civic skills and civic disposition. Civic knowledge refers to citizens’ understanding of the activities of the political system and of their own political and civic rights and responsibilities (e.g. the rights to freedom of expression and to vote and run for public office, and the responsibilities to respect the rule of law and the rights and interests of others). Civic skills refer to citizens’ ability to analyze, evaluate, take and defend positions on public issues, and to use their knowledge to participate in civic and political processes (e.g. to monitor government performance, or mobilize other citizens around particular issues,” she said. She encouraged citizens to fully participate in the activities of the of NaCCED. At the end, one of the leading traditional musicians of Kono, aka Little Gentle was adopted by NaCCED chairman and his team to be part of the campaign of transforming the mindset of young people regarding drug abuse in Sierra Leone.